Juan Sánchez ¿What’s The Meaning of This? Home / Art Exhibitions / Juan Sánchez ¿What’s The Meaning of This? This solo exhibition of the work of influential Latino artist Juan Sánchez was the first time the artist’s work was presented as a solo exhibition in Brooklyn, where he was born and raised by Puerto Rican parents. One of the most significant Latino artists and Nuyorican cultural figures of the late twentieth century, Sánchez is a pioneer for artists of color in the United States. 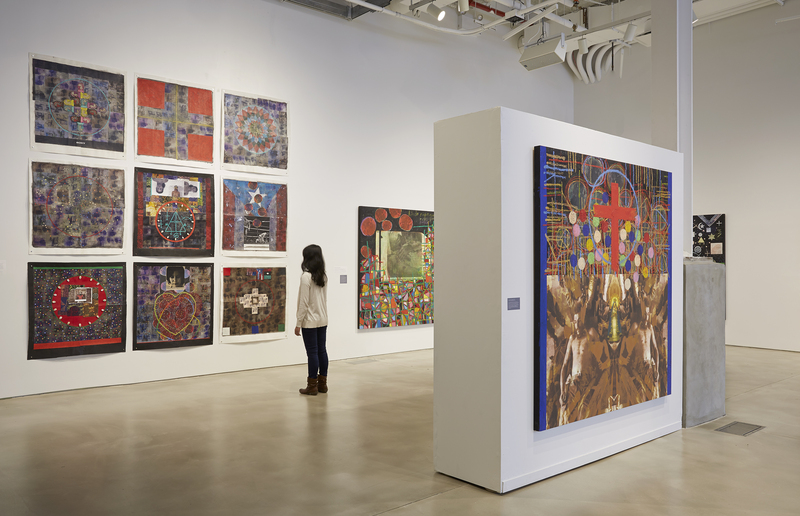 In his complex, layered compositions, he employs symbols drawn from popular and traditional culture, flags, photographs, texts, and abstract passages to explore questions of ethnic, racial, and national identity. BRIC’s exhibition of Sánchez’s work was especially poignant given Brooklyn’s status as one of the most demographically and culturally diverse locations in the country. The Juan Sánchez exhibition featured some 30 works by the artist including large-scale mixed-media paintings, a selection works on paper, and video. There was an accompanying exhibition catalog and public programs. CALL/VoCA Talk: Juan Sanchez, Gallery Walkthrough from Voices in Contemporary Art on Vimeo.